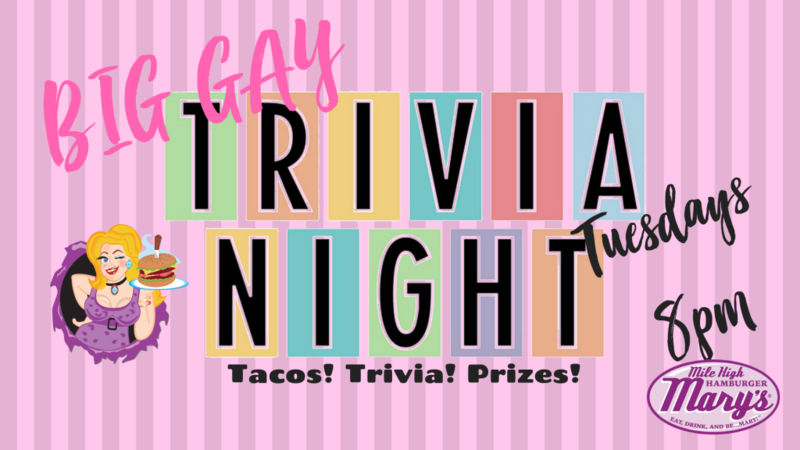 The fun continues AT 8 PM at Mile High Mary’s as we bring you another night of Big Gay Trivia with Big Gay Phil! Hilarious and clever questions to test your knowledge of the obscure and the obviously gay! Full menu, great atmosphere and its also #TACOTUESDAY with a different specialty taco each week, $5 Sauza hand crafted margaritas, and you heard it- 1/2 OFF bottles of wine! Come eat, drink and be Mary! Who’s gonna reach into the drag bag and “build the bear” this week? Get here early for a good seat, sign up your team and find out.